The quality of cutting does not refer to the shape of the diamond (round, oval, pear, etc.) but to proportions, symmetry and polishing. Brightness : clarity created by the reflections of white light on the surface and inside of the diamond. Fire : the reflection of light by different colours of the rainbow. Scintillation : the contrast between black and white caused by light reflection. When cutting a rough diamond, the cutter must obtain an optimum cut while keeping as much matter as possible. When the diamond is shallow. When the diamond is too deep. When the diamond is well-proportioned. 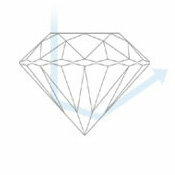 Proportions refer to the ratio between the size, shape and angles of each facet of the diamond. A wide range of combinations is possible, therefore determining the way the diamond reacts to light. When light hits the diamond, approximately 20% of the light is immediately reflected off the surface of the stone. Of the other 80%, part of it heads to the culet of the diamond (where the observer will not be able to see the effect). Each facet on a well-proportioned diamond will be neatly placed and angled to maximise the quantity of light that the crown will reflect, therefore to the eye of the observer. The light reflected off the diamond is perceived as scintillation, fire and brightness. The depth is the distance between the culet and the table of the diamond. 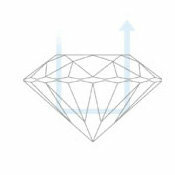 The percentage depth of a diamond is calculated by dividing the depth by the width. So, if a diamond is 3 mm deep and 4.5 mm wide the depth will be 66.7%. 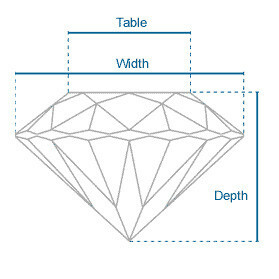 The table (%) of a diamond is calculated by dividing the width of the table as a facet by the width of the diamond. Therefore, if the table is 2 mm and the width of the diamond is 3.5 mm, the table will be 57%. “Excellent” : A maximum of fire and brightness. The diamond reflects practically all the light that enters into the stone creating maximum scintillation and life. “Very Good” : The diamond neatly reflects almost all of the light that enters the stone producing fire and very good brightness. In normal light conditions, the “Very Good” almost perfectly resembles an excellent cut with a lower price. “Good” : The diamond reflects most of the light that enters the stone, giving it a good overall appearance. “Fair” : A lot of the light that enters the stone escapes from the sides or tips of the diamond. “Fair” cuts are no longer accepted. 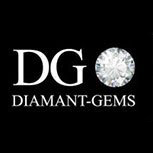 “Poor” : Most of the light that enters the stone escapes from the sides or tips of the diamond. The diamond will be dull and lifeless. Sarin is an optical machine connected to a computer. It is a versatile instrument commonly used by laboratories and diamond cutters. It helps to detect the potential of a rough diamond or to specify the cutting quality of a cut diamond. Once placed on the Sarin, it indicates the exact characteristics (for example the weight after re-cutting a rough diamond). The sarin is also used to improve the cut of a diamond. 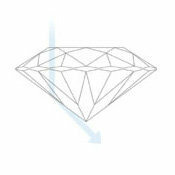 Diamonds that have an old cut, for example, need to be cut again. 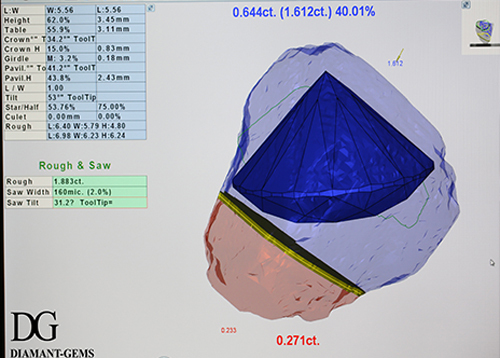 The Sarin machine also offers optimal solutions to improve the proportions and symmetry of a diamond. It only gives instructions to the cutter who will apply them to obtain the required new cut.